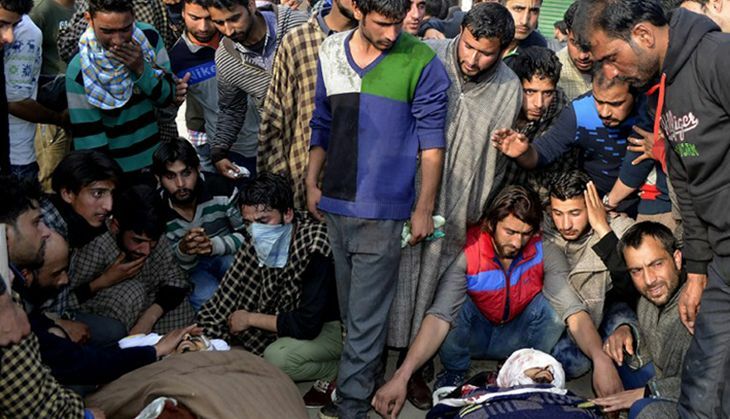 On 12 April, the army in Handwara, Kashmir, opened fire on a stone-pelting mob, which was protesting the alleged molestation of a girl by army personnel, resulting in the death of two youth, and leaving several injured. The death toll has reportedly risen to four. J&K police has suspended an Assistant Sub-Inspector for opening fire on the protestors. Chief minister Mehbooba Mufti said the security personnel involved in the killing of the youth will be given exemplary punishment as such incidents cannot be tolerated since these have a "negative impact" on the state government's efforts to consolidate peace. The army ordered an inquiry while Jammu & Kashmir Police registered a criminal case and began investigations into the incident, which triggered more protests in Handwara and that echoed in Srinagar and Pulwama districts of Kashmir as well. Trouble started with protests by locals in Handwara over the alleged molestation of the girl student. Giving details of the incident, the police spokesman said within minutes of the alleged incident, the public gathered in large numbers and attacked the army bunker in Handwara chowk. They assaulted the personnel deployed there, ransacked the bunker and attempted to set fire to the bunker, he said. "In retaliation, the security forces deployed (there) used force to disperse the violent rampaging mob. In the process, two individuals - Mohammad Iqbal and Nayeem Qadir Bhat sustained fire-arm injuries," the spokesman said. "They were evacuated to the hospital where they, unfortunately, succumbed to their injuries," he said, adding police deeply "regrets the loss of life". The police spokesman said a criminal case has been registered into the Handwara incident and investigations started to ascertain the facts. Nayeem, a student of Government Degree College Handwara, was a budding top order batsman, who had attended an Under-19 national level camp three years ago, his friends said. Several photographs of Nayeem at various cricketing events, including a net session with Jammu & Kashmir's star all-rounder Parvez Rasool, were being circulated on social networking sites soon after his death. In one picture, Bhat is seen shaking hands with a senior police officer before the start of a recent cricket tournament in the district. The incident in Handwara echoed in Srinagar, the summer capital of the state, as also in Pulwama in south Kashmir, where protests erupted and stone-pelting incidents were reported at some places, the official said. Additional police personnel have been deployed in sensitive areas of the city to maintain law and order. The chief minister, who was in Delhi, called up Udhampur-based Northern Army Commander Lt Gen DS Hooda over the issue and was told that the army has ordered an inquiry and that tangible action will be taken once the probe is completed, an official statement said. The security forces must exercise maximum restraint and adhere to the Standing Operating Procedure (SOP) while dealing with the public protests as incidents of innocent killings cannot be tolerated, she said, while expressing solidarity with the families of the two youth. Political parties, like the National Conference and the Congress, expressed grief and shock over deaths and demanded a probe so that the guilty could be punished. Separatist outfit Hurriyat Conference headed by hardline leader Syed Ali Shah Geelani gave a call for shutdown on Wednesday.